In late June, with Ryan Borucki’s MLB debut, Blue Jays fans got to see the beginning of their next wave of young starting pitchers. By mid-August, fellow next wavers Sean Reid-Foley and Thomas Pannone had their MLB debuts as well. In their short time in the majors, each showed a glimpse of their big-league potential. In 2018, the average MLB starting pitcher produced a .315 xwOBA, which accounts for strikeouts, walks and a pitcher’s xwOBA on batted balls (the contact quality they’ve given up). In terms of the stat, each of the three rookies produced slightly better-than-average marks in their MLB debuts. Borucki (.313 xwOBA) pitched the most of the bunch, facing a total of 415 batters over 97.2 innings. Pannone pitched both as a starter and as a reliever. As a starting pitcher, Pannone (.313 xwOBA) faced 151 batters across 35.2 innings. Reid-Foley (.314 xwOBA) pitched roughly as much, facing 150 batters over 33.1 innings. Clearly, we’re talking about pretty small sample sizes for all three. However, the totality of their performance suggests there is reason for optimism, with each young pitcher excelling in their own way. In terms of strikeouts, walks and contact quality, Ryan Borucki didn’t stray too far from the average in any regard. He ran a strikeout rate (16.1%) that was a bit below-average (21.6%) and a walk rate (8%) that was exactly average (8%). His main strength was generating weak contact quality—his .342 xwOBA was well below that of the average starting pitcher (.367). Digging a little deeper, we find that he was equally effective at limiting base hits and home runs. His xBA on batted balls (.311) was better-than-average (.325), highlighting his effectiveness at preventing base hits. His barrel rate (4.6%) was a touch better-than-average (4.8%), similarly showing that he was also adept at limiting the long ball. His quality also shines through in traditional stats, like ERA (3.87, 9th among 39 qualified rookie SP), and in non-Statcast advanced stats, like FIP (3.80, 6th among qualified rookie SP). He came into the season viewed as a high-floor starting pitcher, so his general solidity in his first taste of the big leagues is a welcome confirmation of that. Moreover, he showed that he could be a potential innings-eater, like his idol Mark Buehrle. The median MLB start this season lasted 5.2 innings. Borucki pitched at least six innings in 12 of his 17 starts (70.6%). Among the 151 starting pitchers who started 15+ games this season, Borucki’s rate of 6+ inning starts ranks 22nd. Among rookies, he ranks second. This combination of effectiveness and longevity helped him produce 1.7 fWAR, fifth-most among rookie starting pitchers. In his MLB debut, Thomas Pannone didn’t strike many batters out (12.6% K rate) and walked a few too many (9.3% BB rate). However, there is sure to be some positive regression there. After all, he struck out 24.2% of batters between AA and AAA, while walking only 6.1% of those he faced (162.2 innings). His league-average xwOBA was entirely the result of the exceptionally weak contact he gave up. Of the 201 starting pitchers who allowed 100+ batted balls this season, Pannone produced the fifth-best xwOBA on batted balls (.316). Digging deeper helps us understand where he ran into trouble. His barrel rate (6%) is well above the league average (4.8%), which contributed to his high home run rate. While the average starter gave up 1.21 home runs per nine innings, Pannone gave up 1.77. On the other hand, he showed an elite ability to limit base hits, with his xBA on batted balls (.267) tops in the majors. The gap between him and the next best pitchers (Blaine Hardy and Matt Boyd, .282) was equal to the gap between them and the 18th-best pitcher (Marco Estrada, .297). All those walks and homers (with a limited number of strikeouts) meant that his FIP (5.11) was never going to reflect kindly on his performance. That said, his roughly league-average ERA (4.19) speaks to the fact that he gave up few base hits—his .234 BABIP isn’t concerning, as it was well-supported by his .241 xBABIP. He also showed some early promise as an innings-eater, with four of his six starts going at least six innings (and a fifth going five and a third). Sean Reid-Foley entered the season needing to prove himself at Double-A, after his rough 2017 season at the level. And, he did, producing well at both Double-A and Triple-A (3.26 ERA, 3.19 FIP) before his deserved promotion to the big leagues. As a major-league starting pitcher, Reid-Foley acquitted himself reasonably well, evidenced by his league-average xwOBA. His main strength was striking out batters, with his two ten-K starts notable examples of this. He struck out an absurd 28% of the batters he faced, putting him in the 90th percentile among starting pitchers with 20+ innings. Underlying those strikeouts were countless whiffs—his 12.1% swinging strike rate put him in the 86th percentile among SP. He actually did a decent job of generating weak contact—his xwOBA on batted balls (.371) was roughly league-average—though you wouldn’t know it by looking at his 1.62 HR/9. His main issue was giving up barrels, giving them up at the same elevated rate as Pannone (6%). Like Pannone, though not quite to the same extent, Reid-Foley effectively limited the kind of contact that leads to base hits, producing an xBA on batted balls (.316) that was better than the average SP (.325). His massive walk rate (14%) was his biggest issue. There are countless ways to analyze this, but I think one particularly relevant point is that he lost a lot of full count battles. Starting pitchers earned a strikeout in 26.1% of full counts and gave up a walk in 30.1% of them. While Reid-Foley’s strikeout rate in full counts was normal (25%), his walk rate (45.8%) was anything but. Only four SP gave up 3-2 walks more often than Reid-Foley (minimum 20 full count opportunities). Given that, overall, he threw strikes at roughly the same rate (43.4%) as the average SP (43%), it stands to reason that the tools are there for him to improve. It seems like he just needs to make those important pitches, as many others have suggested. His decent overall performance isn’t quite evident in his ERA (5.13) or FIP (4.96), but there might be good explanations for that. His ERA was inflated by a couple of things. He dealt with some bad batted ball luck, with a BABIP (.313) that was much higher than his xBABIP (.280)—the biggest such gap among Blue Jay SP this season and the 14th biggest gap among the 243 SP who allowed 50+ balls in play. He also got lit up twice, surrendering six runs each against Cleveland and the Yankees. Over his other five starts (cherry picking alert!!! ), he produced a very good 2.59 ERA. His FIP was brutal because all of those strikeouts didn’t end up making up for all of the walks and homers. However, those two blowouts are a big reason why—of the six homers he gave up in his seven big-league starts, five (!) came in those two blowouts. His FIP in the other five games? 2.59. Ultimately, moderating the walks, while still generating weak contact and striking out boatloads of batters, will be his central focus in the coming year. Working on this post gave me a good sense of what these three young starting pitchers did in 2018. In terms of xwOBA, they were each league-average. Borucki looked the most MLB-ready of the bunch. His solid xwOBA was backed up by a better-than-average ERA and FIP. Plus, he pitched a ton, racking up the 23rd most innings among SP after June 26th. Pannone and Reid-Foley showed clear strengths—Pannone’s ability to limit base hits is extraordinary, while Reid-Foley can strike out batters with the best of them. They also showed clear weaknesses—Pannone struggled with strikeouts, walks and dingers, while Reid-Foley struggled with walks and dingers. Borucki’s spot in the 2019 rotation seems written in ink to me. For the other two, we’ll have to wait and see. As my fellow JFtC writers have discussed, the Blue Jays rotation is full of question marks beyond Marcus Stroman, Aaron Sanchez and Borucki. On the one hand, there’s a strong case to be made for going out and signing one or two free agent starters. They might be rebound guys on one-year deals—like Lance Lynn, whose 3.84 FIP and .309 xwOBA suggests he was a lot better than his 4.77 ERA—or trusted veterans (like J.A Happ) or more ambitious long-term pieces (like Yusei Kikuchi). That would lift the team’s win floor and allow both Pannone and Reid-Foley to develop a bit more, outside the spotlight of the major leagues. On the other hand, 2019 is a rebuild year with limited MLB expectations. The two of them held their own, all in all, so sending them back up against the best hitters in the world is justifiable. The main concern is what to do with the MLB rotation in case they show that they need to be sent back down to AAA. Guys like David Paulino, Jacob Waguespack and Julian Merryweather are all options to fill-in, but they looked in 2018 like they still need polish as starting pitchers. My preference is the former. The Blue Jays only have about $97.8 million in payroll locked in for 2019, for 14 players. $64.7 million of that total covers the salaries of Russell Martin, Troy Tulowitzki, Kendrys Morales, Justin Smoak, Lourdes Gurriel Jr., the retained salary of Jaime Garcia and the buyout of Yangervis Solarte’s option. 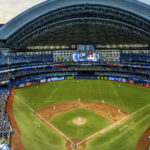 Another $33.1 million comes in the form of projected arbitration awards for Marcus Stroman, Ken Giles, Kevin Pillar, Randal Grichuk, Aaron Sanchez, Devon Travis, Ryan Tepera, Brandon Drury and Joe Biagini. The team would be wise to use some of that excess payroll (relative to the mid-$100 million range of recent years) to pad the rotation and bullpen. With the rotation, I’m kind of indifferent between the various options I highlighted above, each being reasonable options. A big move for a star Japanese pitcher would be cool, as would a trade for a long-term option that we aren’t even aware of. Obviously, with the bullpen, some vets on one-year deals makes the most sense. The biggest lesson of the last two seasons is that MLB teams will use more than five starting pitchers in a 162-game season. As such, Pannone and Reid-Foley will almost definitely spend some (or a lot) of time in the big leagues next season. From what I can tell, their debuts each showed off something very positive. If they’re able to build on those strengths, while working on their weaknesses, they have a legitimate shot of becoming MLB starting pitchers for the long-haul. I’m an economics professor in the GTA whose lifelong love for the Jays was reignited by that magical August of 2015 and the amazing moments since. I'm an economics professor in the GTA whose lifelong love for the Jays was reignited by that magical August of 2015 and the amazing moments since. PREVIOUS Previous post: What Can the Blue Jays Expect from Brandon Drury?